Apex locators have become commonplace in the clinical practice of endodontics. They have shown remarkable accuracy and reliability. Part of the skill in using an apex locator is understanding when the reading is reliable or not. There are certain conditions where an apex locator may not give a reliable reading and traditional length determination using radiographs is required. For radiographic length determination we rely upon our files and radiographs. For a quick review of terms, the radiographic apex is where the apex appears on the film. The anatomic apex is where the apical foramen is positioned, which may or may not be at the most apical part of the root. When using radiographs to determine the length of the root, it is recommended that we estimate the length of the root from 0.5mm-1.0mm from the radiographic apex. The reason for this estimation goes back to the early 1970's. 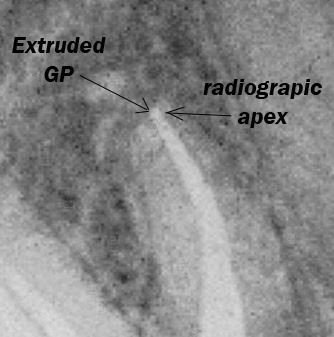 Palmer, Weine & Healy 1971 showed that when teeth are filled to the radiographic apex, the gutta percha is extruded out of the canal 50% of the time. Burch & Hulen 1972 found that the apical foramen deviated from the anatomic apex 78%-99% of the time. Because of these early length studies, it is recommended to estimate your length short by 0.5-1.0mm. Here is an interesting case that demonstrates how filling to the radiographic apex may actually be filling long. 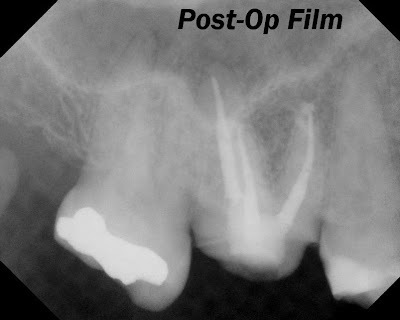 Here is a post operative film following RCT of #3. I think most people would assume that the obturation looks pretty good. 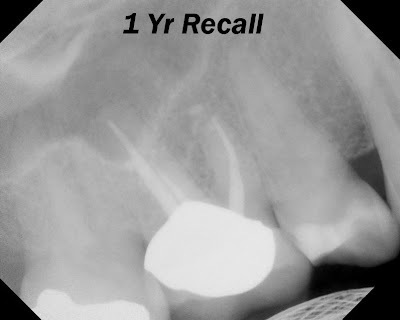 1 year recall looks good radiographically, however the patient continues to reports some sensitivity. 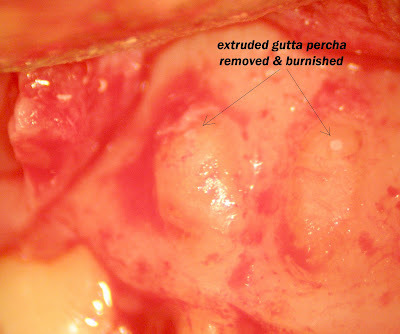 Surgical exposure of the root apices shows the extruded gutta percha and sealer. 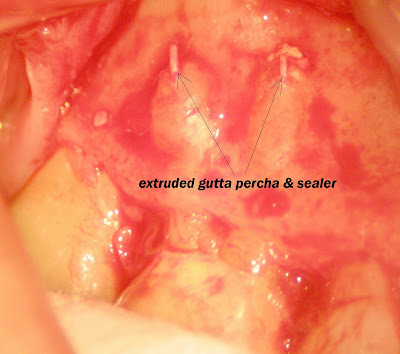 Simple apicoectomy removes the extruded gutta percha. This case shows how easy it is to overfill a root canal. Length determination using apex locaters as well as radiographs is an important skill for any clinician performing endodontic therapy. Just ran across your blog--a blog right down my alley.